Baby Boomers are not broke! In the United States alone, Baby Boomers will spend about $3 trillion. Hard to believe, but it is one of the most underserved market segments. Baby Boomers have been ignored by marketers because the 18-34 year old consumers are a more attractive group to advertisers. Younger people stereotype older people as useless, helpless, or devalued! Young people are not alone with these negative impressions. Attitude is everything! We generalize about people based on how they look, speak and act. Often these generalizations are based on unfounded ideas, but fit a particular stereotype. Most stereotypes have some basis in reality, but usually are negative and do not represent the whole segment. A stereotype is a widely held, but fixed and oversimplified image or idea of a particular person or thing. Forget the stereotypes of older people because they are wrong! Older people are a huge market who will need a variety of services ranging from assistance to supporting their active lifestyle. The senior market is booming and you can start a business to serve that market. You can sell existing products or services or meet an unmet need. It will not be easy, because they have seen it all, but anything worthwhile never is. This is growing and lucrative market. Living facilities – There are over 55 year old communities, assisted living facilities, or alternative living arrangements. As older people age and children leave home, they want to live with other older people in their own community. Often, these communities have single level homes, community services such as health facilities, tennis courts, community pools and other support services. As they age, they may want group facilities where other people can support and check on them. Some older people cannot get out unless they have a shuttle or taxi to take them to appointments or shopping and others may want delivery of products or services. Group activities – Travel, interests, sports, social, pets, games, volunteering, art & crafts, classes, movies, exercise classes and much more. Many seniors are active and others are not, there is a variety of activities for everyone. You can provide bus trips or tours to casinos, national parks, sightseeing or other activities. You can have a very good business providing these activities to senior citizens. Assistance – There are service pets, Seeing Eye dogs, pets, companions, nursing, personal assistants, medical devices, cooks, cleaning services and more. Older people need help in a variety ways and levels of care. Older people prefer to remain independent and live in their home. Change is more difficult as you get older! The level of service generally increases as you get older. Initially, you may need a hearing aid or you may want someone to keep track of things for you. As you get older, you will need more services and this is a growing business as older people live longer. Personal services – This ranges from grooming to dating and everything in between. There are social activities that are targeted to seniors such as group travel local and otherwise that can encourage socialization. There is a constant search for the fountain of youth and there are a lot of people willing and able to buy a variety of cosmetic services or even plastic surgery. A good support network helps you live longer! As you age, your contemporaries may not live as long and you need to expand your network. Targeting this age group can develop many services. Other – Somewhere between retirement and entering an assisted living facility, there are a lot of services which older people may use. They may want prepared or special diet meals because they no longer can cook or help with bathing or getting dressed. Often a companion/helper can help older people through this period. Long Term Care insurance generally pays for these services when you can no longer take care of yourself. You may just need someone to check up on you daily or to make sure you take your medication. There are many existing products and services for older people which may be a great business. 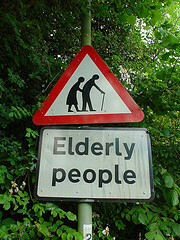 There are probably many more that may develop over the next few years as more people turn sixty-five (65) years old. 10,000 Baby Boomers are turning sixty-five (65) years old every day! This is a growing market segment and you can take advantage of it. This is a $3 trillion market segment that is just waiting for solutions for the various needs older people have. Baby Boomers have a lot of money to spend! Krant, I agree that baby-boomers are a very large and fairly ‘virgin’ market. However, I also think that we’ll have to learn to think about this age group differently if we are to be successful in targeting the market. Today, at 55 (or even 65 and older) people don’t really want (or need) assisted living and motorised wheelchairs. They are still active, fun loving bunch who travel the world and engage in activities that were for the 30 year olds – but differently. (You know that I love hip-hop and nightclubs, don’t you?). I am stuck in the 60’s! I still like that music and only occasionally like some of the newer music. There are a lot of opportunities marketing businesses to the baby boomers, but it is not for everyone. I just thought I would point out the opportunities.